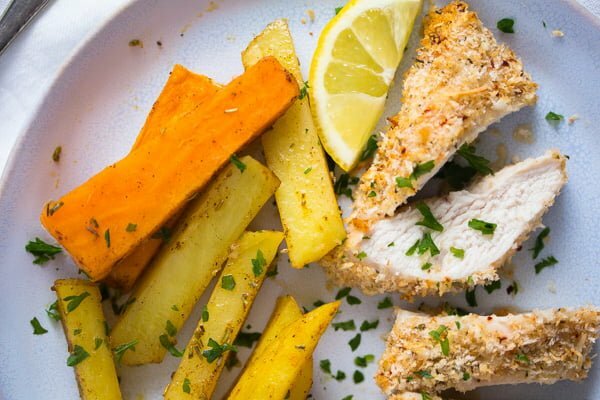 Healthy and delicious crispy baked chicken breast with a panko Parmesan crust. Tender on the inside and crispy on the outside. That’s the way a panko breaded chicken should be. And preferably, it should still be like that when the panko Parmesan chicken is baked in the oven and not fried. And that’s the way today’s crispy baked chicken breast is! So moist and tender on the inside and so crispy and hearty on the outside. 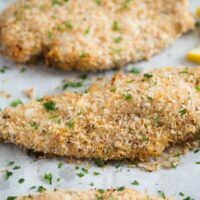 The panko breaded chicken need a relatively short time in the oven, not enough time for the panko breadcrumbs to become golden and crispy. 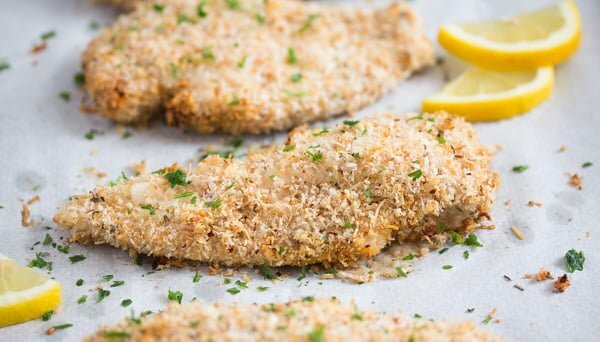 To help with this process, I pan fry the panko breadcrumbs for a few minutes before coating the chicken breasts with the crumbs. Heat the oil in a large frying pan. The oil should be really hot (but not smoking) when you add the panko breadcrumbs. Fry, stirring almost continuously, for about 2 minutes, the panko breadcrumbs should become really nice and golden. Immediately, transfer the panko onto a large dinner plate and let cool completely. It will not take that long for the panko to cool. Once cool, add the freshly grated Parmesan cheese, dried herbs, paprika powder, salt and pepper. You can also bake the panko breadcrumbs. Preheat the oven to 210 degrees Celsius/ 410 degrees Fahrenheit. Give the breadcrumbs to a baking tray lined with baking paper. Level well. Bake for about 5-7 minutes or until nicely golden, stirring once and leveling again after about 3 minutes. I prefer the stove top version because it is faster. Usually, I would use eggs to bread chicken breast or schnitzel of any sort. However, this time I used yogurt. Not my idea, I saw it somewhere on TV and was intrigued, so I tried it with my next batch of panko Parmesan chicken. And I loved it! The yogurt makes the chicken breast even juicier and I find it easier to use than eggs. 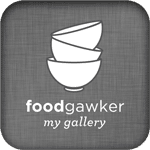 Not that eggs would be particularly challenging, it is more about the fact that whenever I make schnitzel or panko breaded chicken, I end up throwing away some of the eggs needed for the breading. Not the case with the yogurt. If you notice that you need some more, it is enough to add ½ tablespoon to the plate, you don’t need to beat a whole new egg for the last schnitzel. 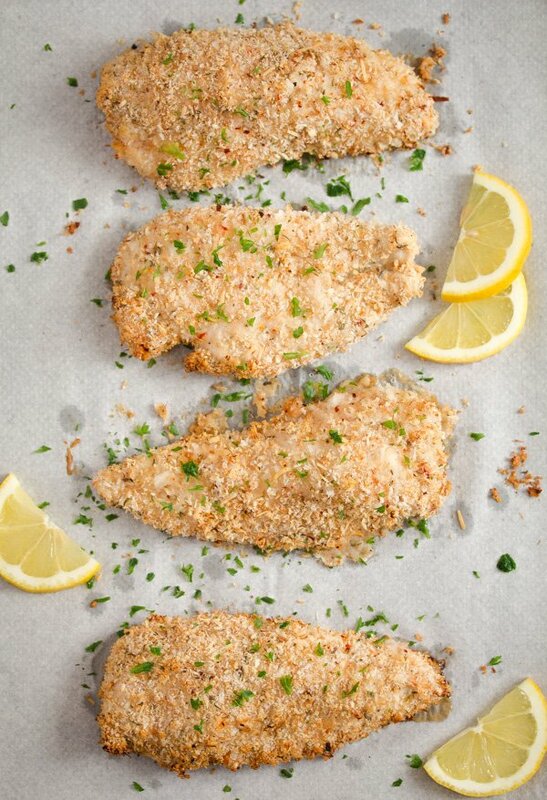 I use low fat creamy yogurt (Greek style) for the panko breaded chicken. 1 tablespoon per piece of chicken breast should be enough. 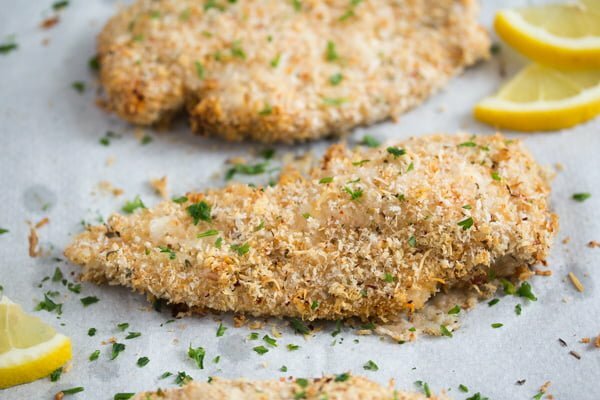 You will need boneless, skinless chicken breast weighing about 130 g/ 4.5 oz each to make the panko Parmesan chicken. If your chicken breasts are smaller or larger, you will have to adjust the baking time accordingly. Step 1: Give some flour to a large plate. Give the yogurt to a shallow bowl. The panko Parmesan mixture is already on a large plate. Pat the chicken dry with kitchen towels. Line a baking tray with baking paper. Step 2: Dredge the chicken breast through the flour and shake over the sink to remove the excess flour. Step 3: Run the chicken pieces through the yogurt and coat it lightly. I prefer to use my hands and rub the chicken with the yogurt, this way the yogurt coating will not be too thick, the chicken should be just smeared with the yogurt and not thickly coated. Step 4: Lay the chicken in the panko Parmesan plate, turn it over and press it into the breading to coat. Preheat the oven to 220 degrees/ 430 degrees Fahrenheit (convection oven 200 degrees Celsius/ 400 degrees Fahrenheit). 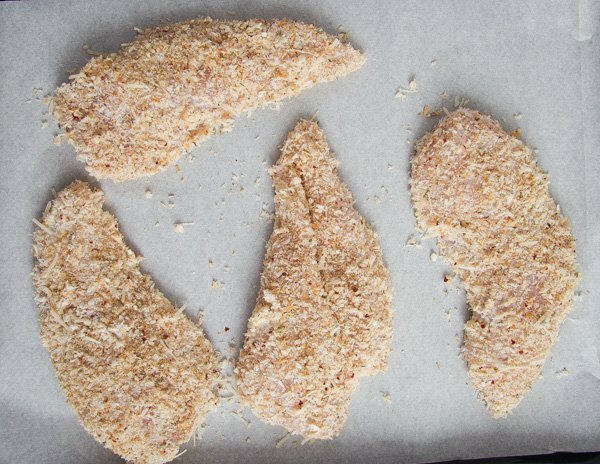 Place the panko breaded chicken breast on the baking tray. Spray it lightly with olive oil. 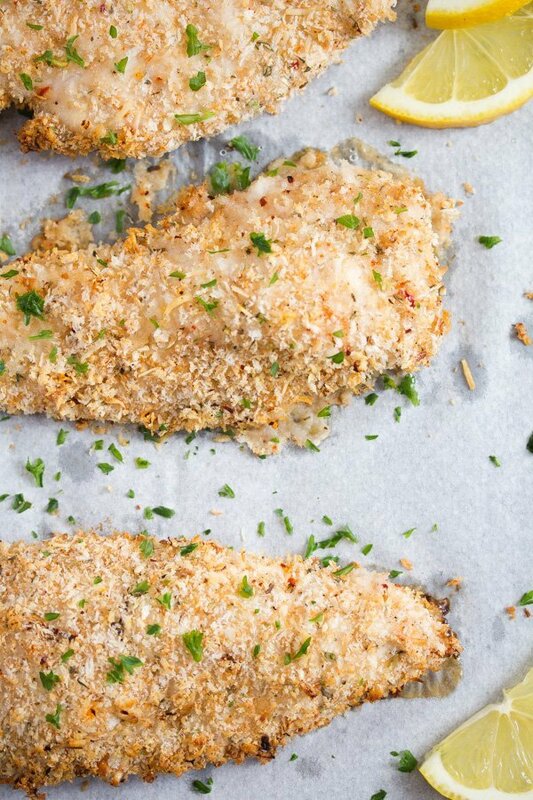 Bake the panko Parmesan chicken in the preheated oven for 10 minutes. Turn the chicken on the other side, spray it lightly with oil again and continue baking for another 8 to 10 minutes. The juices of the chicken should run clear, when you pierce the chicken into the thickest part. If you want to use a kitchen thermometer to check if the chicken is ready, the internal temperature of chicken should be of 75 degrees Celsius/ 165 degrees Fahrenheit when measured in the thickest part of the chicken. Preheat the oven to 220 degrees/ 430 degrees Fahrenheit (convection oven 200 degrees Celsius/ 400 degrees Fahrenheit). Line a baking tray with baking paper. Heat the olive oil in a large frying pan. Fry the panko breadcrumbs, stirring almost continuously, for about 2 minutes or until golden. Immediately, transfer the panko onto a large dinner plate and let cool completely. You can also bake the panko breadcrumbs. Preheat the oven to 210 degrees Celsius/ 410 degrees Fahrenheit. Give the breadcrumbs to a baking tray lined with baking paper. Level well. Bake for about 5-7 minutes or until nicely golden, stirring once and leveling again after about 3 minutes. Transfer to a plate and let cool. Give some flour to a large plate. Give the yogurt to a shallow bowl. 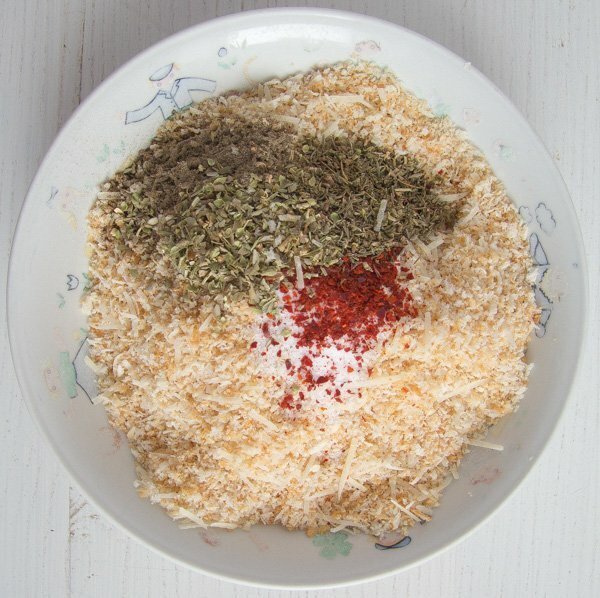 Mix the panko on the plate with the grated Parmesan, oregano, thyme, rosemary, paprika, salt and pepper. Pat the chicken dry with kitchen towels. Dredge the chicken breast through the flour and shake over the sink to remove the excess flour. Run the chicken pieces through the yogurt and coat it lightly. I prefer to use my hands and rub the chicken with the yogurt, this way the yogurt coating will not be too thick, the chicken should be just smeared with the yogurt and not thickly coated. 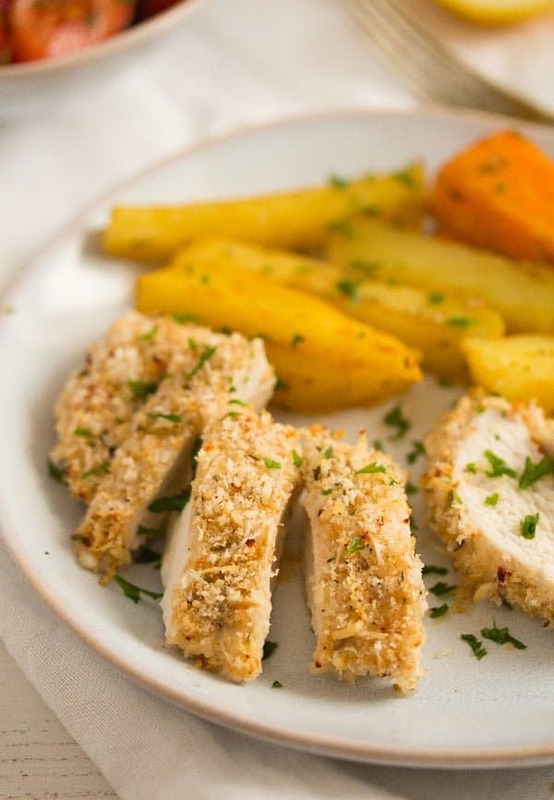 Lay the chicken in the panko Parmesan plate, turn it over and press it into the breading to coat. 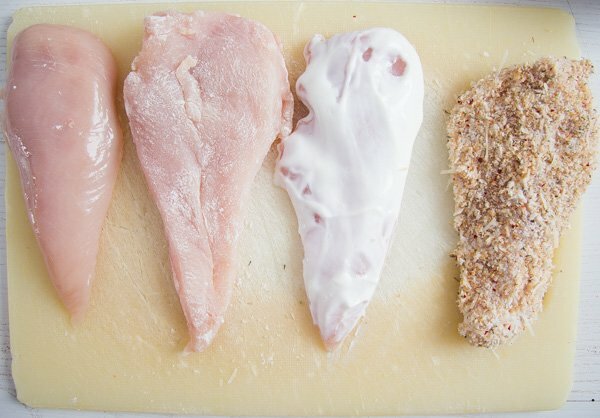 Place the chicken breasts on the prepared baking tray. Spray with olive oil and bake for 10 minutes. Turn the chicken on the pan, spray with olive oil again and continue cooking for about another 10 minutes or until the chicken is cooked through but not overcooked. The juices of the chicken should run clear, when you pierce the chicken into the thickest part. Serve immediately as suggested above. Using yogurt is an interesting idea! It seems to do a better job in holding the breading onto the breast and I bet it does add a nice layer of flavor. Thanks for sharing Adina! Thank you, MJ. The yogurt is really nice, keeps the chicken moist. It sounds really delicious! I often make chicken katsu in the oven, but never tried with parmesan or yogurt. Great idea!